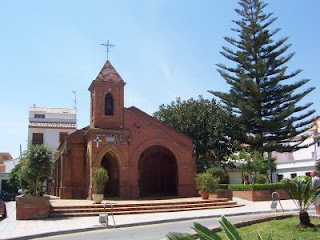 Just got back from Duquesa in Spain. 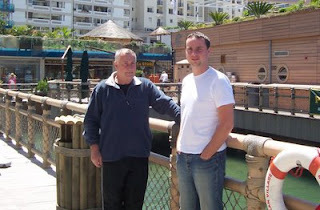 John and I spent two wonderful weeks in this sunny Andalusian town staying with our son Drew. Drew's home in Sabanilla is situated near the golf course and only ten minutes walk to Port Duquesa and its marina and golden mile of sandy beach. We spent lots of time walking in the fresh air and eating out and it was lovely to spend quality time with Drew when his work commitments allowed. This peaceful view is looking out from Drew's balcony. Viewing its perfect stillness around dusk was ideal for chilling out after a busy day. The occasional mozzie was an unwelcome visitor but small lizards were fine and fun to watch. 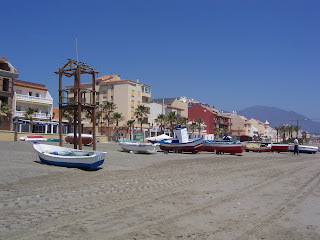 One of our favourite walks took us from the Marina surrounded by pavement cafes to the sandy beach and along to the main hub of the town, then back in a circular route to the golf course. 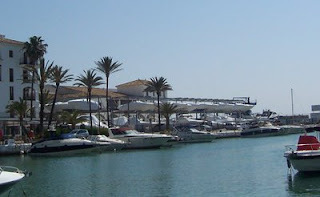 This photo shows a speedboat super store. I thought it quite funny that speedboats were on shelves, wrapped and ready to go! The beach is lovely. It was very quiet while we were there with few tourists about but that meant we had plenty of space to explore. A fresh water culvert running into the beach from the hills behind has become overgrown with reeds and grasses making the perfect habitat for water snakes, turtles, frogs and little fish. We enjoyed watching these wild creatures in their natural setting. 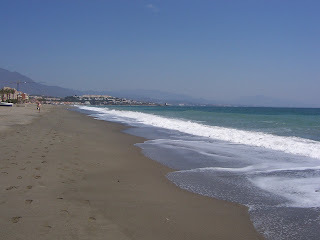 pointing north towards Estepona and the Costas. beyond are just visible. A brisk wind made this day's walk quite invigourating. It certainly blew the cobwebs away! The last stretch of our walk took us through some scrubland bordering half finished property developments laid waste because of the economic downturn. 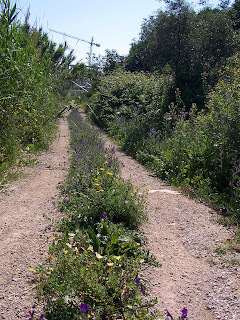 However, nature had taken over and wild flowers flourished bringing a joyful interest to the last leg of our trek. 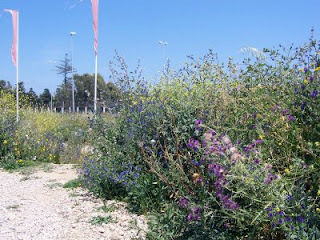 Wild flowers were in abundance on all our walks. 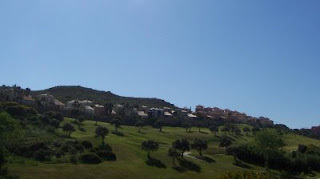 Another walk we enjoyed was along the path skirting the golf course and approaching the hills behind Sabinilla. 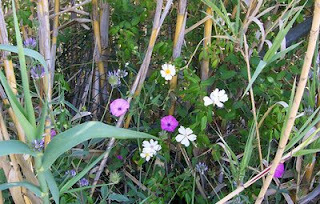 The same culvert that flowed out into the beach was now virtually hidden by reeds and wild grasses. 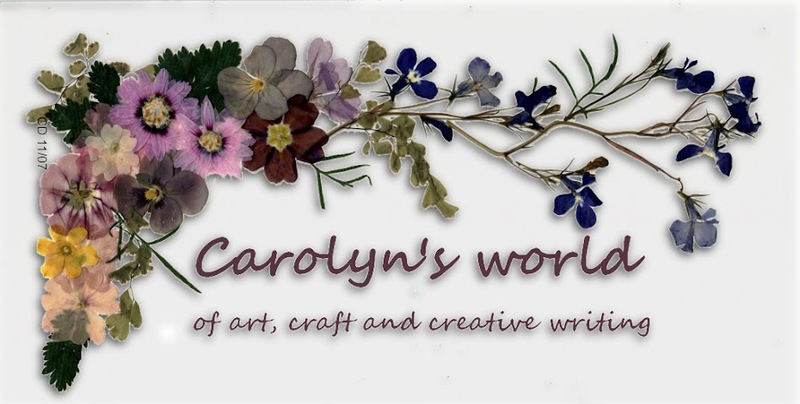 Flowers such as wild roses and morning glory competed for space. couldn't name and I found myself singing bring flowers of the rarest and blossoms the fairest... and it was as if the shrill call of frogs, crickets and birds joined in with me. 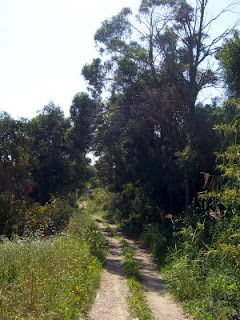 It was a truly wonderful walk with nature. 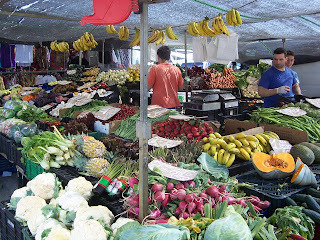 Eating out and visiting markets were very much part of our holiday. We tried various restaurants and pavement cafes. Pancakes with maple sy rup and 'moosli' a concoction of granola, roasted almonds and oats finished off with a twist of apple made for an indulgent canadian style breakfast at the Straw Donkey. 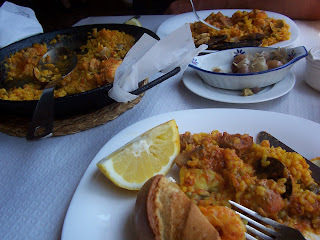 I'm not a lover of paella but have to admit that the one we tried at Restaurant Alphonso was the best we ever had. Tomato flavoured rice with peas, cram packed with king size prawns, pork, mussels and tiny clams with a huge wedge of lemon and freshly baked bread on the side made this dish a winner! We hung out at Gibraltar for a couple of days meeting up with Drew for lunch. 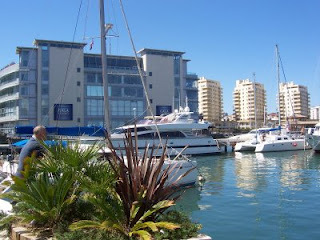 The brand new Marina development was impressive and its iconic architecure a sharp contrast to the more traditional Victorian architecture of old Gibraltar. 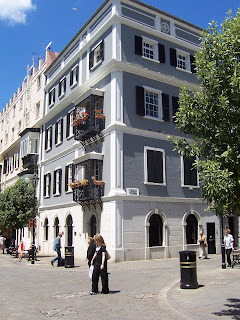 The Cathedral in Gibraltar can almost be missed. Its doors opening straight onto the street and sandwiched between the shops of Main Street. A curious notice on its door reads At the heart of every community are the intelectually disabled and their carers. It deserves a lot of deep thought. 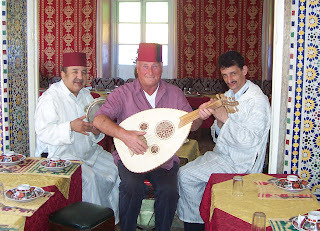 We booked for a couple of days at Tangiers, staying overnight at a hotel with dinner and breakfast and tour guide. I must have been remembering my thirst for adventure in my teens and forgetting my discernment of later years because it wasn't too long before I had misgivings. A fierce argument between a porter and passeng er at the port of Algeciras brought Spanish police running but left me feeling vulnerable. 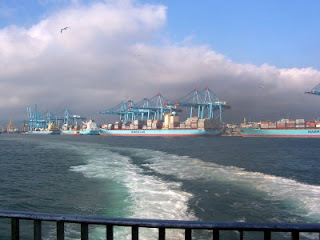 The ferry crossing and approach to the African continent seemed surreal. So many forms to fill in and passports scrutenised at every opportunity. A party of students from the US on an exchange visit were instructed by their tutor on what to do and what not to do and I was glad to eavesdrop. We were all made to walk through a contraption that recorded body temperature. A little American girl was identified as having a raised temperature and she was taken away in tears with her Mom while the rest of her family looked on in despair. An abrupt ending to their family holiday! This same measurement of body temperature wasn't used at Spanish or English customs. for me and in contrast, I know how lucky I am. Our taxi was awful and stank of dried pee and dogs and we were glad to get out to see the camels. It was just another ploy to get us to part with money and we were even gladder to get back into the taxi and shut the doors in fear of being mobbed by hysterical camel owners and jewellery sellers...help! I did enjoy seeing Bedouin women in their native dress. 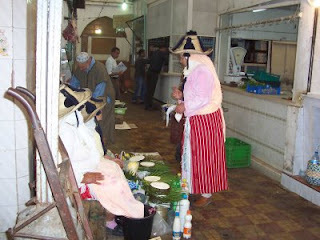 The photo above shows them selling cheeses wrapped in plaited rush but the same women can only find small spaces to sell their wares and can be moved on by the police. It is also a familiar sight to see Arab women sitting in groups on pavements, hoping someone will come along and offer them work for the day. We had lunch in a typical Morro can restaurant complete with musicians before moving onto our hotel which proved to be first class, thank goodness! 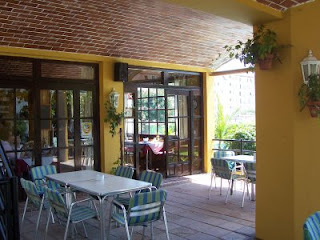 It had a lovely garden and lounge where we joined with locals to watch the Chelsea/Barcelona football match on TV. After the events of the day I had no wish to venture out again until our departure the next day. Yes, we bought a rug. 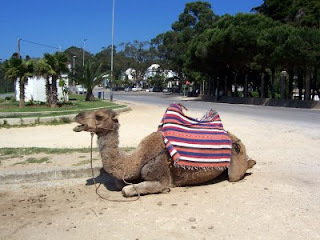 It was our only means of escape and while I'm happy to help out the Bedouin economy and I love the design of the rug itself, made from colourfully died camel hair and lambs wool, I didn't like the pressure we had to endure to buy it. Mustapha, our sales person, complete in Arab smock six inches too short showing his thin brown socks and lace up shoes and one blind eye insisted on showing us the view from the roof of the craft centre. 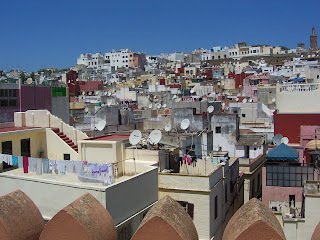 We climbed three or four stories to see the view he was so proud of and he pointed out where the French, English and Moroccan quarters were. All I could see were sky dishes as far as the eye could see and I wanted to go home. Thank God we survived it all and the ferry trip back to Algeciras couldn't come soon enough. 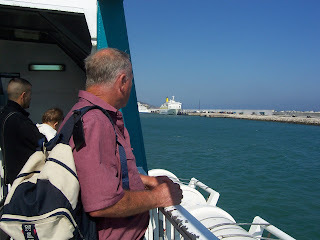 It was late arriving in port and thankfully Drew had waited patiently to take us back to Duquesa. I managed to aquire a few bites in Tangiers that turned nasty. A parting gift I could have done without. We had one more day in Spain before our journey home. We were going to relax by the pool but needed to visit the chemist, then the Doctor's surgery which was closed and then back to the chemist again. Drew was concerned and offered to take me to Gibraltar for treatment but I said no! He works long hours and the antisceptic I got from the chemist would probably stem the infection until I got back to England. Drew and his Dad went out for the evening and I stayed in to pack and have some quiet time to myself and made friends with a lizard on the balcony. Our flight home was good and while there was much to enjoy during our visit with Drew I was happy to be home again. The bites are healing, thank goodness and I'm looking forward to getting back into a routine... now where did I put those holiday brochures? 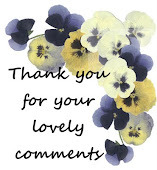 Fabulous story ,Thanks for sharing! Wonderful pics too! lovely family! I'll be back to read more..!